If one of your new year’s resolutions was to travel more this year, look no further! We have compiled some of the most talked about travel destinations of 2019. Whether you’re looking for a beautiful nature retreat, a stunning beach vacation or a spectacular exploration you will find it all on this list. If you’re wondering how to start your journey the right way you can use our airport transfer services to make the start of your travels relaxing and stress-free! 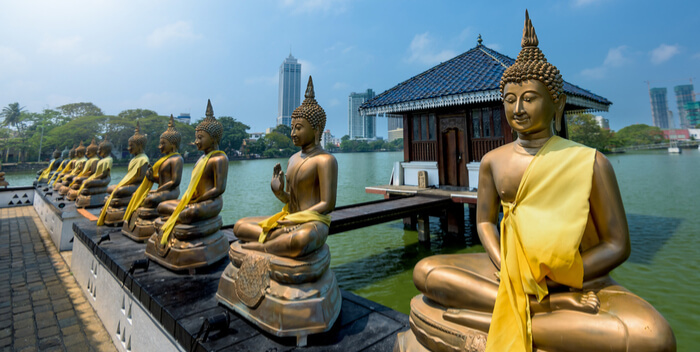 Boasting beautiful beaches, shopping malls and temples, Colombo, Sri Lanka has a bit of everything. If you’re into traditional architecture and history you can visit the National Museum. If you would like to explore other religions or cultures you can discover the city’s many temples or if you’re into relaxing and having fun you can visit Excel World Entertainment park. Colombo is a city with a vast history, stunning views and many photo opportunities. It was even named the ‘most-photographed’ travel destination! Known for its breath-taking gardens, Yokohama also offers a great adventure for art and history lovers with many museums and art galleries. There is also a harbour that boasts an amusement park and an aquarium. With lots of great food, shopping areas and landmarks, you will absolutely adore exploring the Yokohama city centre in Japan. Cambodia is a country in the southeast of Asia with stunning temples and archaeological sites. This location is perfect for someone who wants to learn something new about Asian cultures. Their temples look like they are straight out of an Indiana Jones movie and you could spend endless hours exploring and admiring the architecture and beauty of each one. Cambodia also has a beautiful mountain and waterfall called Phnom Kulen as well as a picturesque beach. Canterbury is a New Zealand region on their South Island that boasts clear lakes, snow-tipped mountains and endless green fields. Christchurch is its largest city which offers botanical gardens and is celebrated for its art scene. It has a large harbour just outside Christchurch where dolphins are a frequent sight. In other coastal areas of the region, you can go on whale-watching tours and visit its beautiful beaches. You can also go skiing in the national park and explore the mountaineering destinations. You can fly out of Manchester to get to New Zealand directly and here at Airlink we offer airport transfers from your home straight to Manchester airport saving you the hassle of parking or getting the train! If you’re looking for somewhere a little closer to home, you can visit the sprawling city of Galway in the Republic of Ireland. Galway is a harbour city in the west of Ireland. You can explore its traditional pubs and go shopping in the city centre known for its live Irish folk music. You can also visit Dunguaire Castle, the Druid theatre company or travel to see the Galway International Arts Festival which is held in July. We offer our airport transfer services to Liverpool and Manchester airport which both offer direct flights to Galway.